The fireflies are back, usignoli, or nightgales, and crickets provide the soundtrack, watermelons block the entrance to the fruitshop, and the barbecue has been dragged out of the cantina. Welcome to l'estate and another issue of the Marche Voyager quarterly newsletter. Some of Italy's finest peaches are grown in the Marche around the small town of Montelabbate near Pesaro. The mild climate and well-drained soil of the Foglia valley are ideal for growing the fruit, noted for its sweet flesh and dark plush skin. So good is it that the town holds an annual Sagra delle Pesche, set to take place this year on Sunday 17 July. Meanwhile down south at Porto San Giorgio on the coast, Sunday 17 July also sees the Festa del mare, a celebration of all things fishy, and featuring a giant "frying pan". The Padella gigante dell'Adriatico is six metres in diameter, holds some 1,000 litres of cooking oil and is used to fry roughly 1,000 kilos of baby squid and sardines in around three hours. 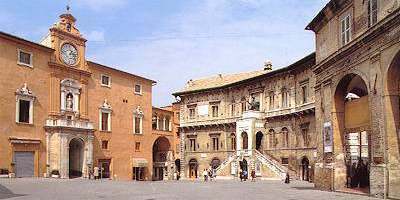 This month's image of one of the region's 500 or so piazze features the scenographic main Piazza del Popolo in the provincial capital of Fermo. Sansovino's grand statue (1590) of the Bishop of Fermo who became Pope Sixtus V tops the main entrance to the town hall. The baroque music of Giovanni Battista Pergolesi is celebrated at his home town of Jesi and other nearby towns at the annual Festival Pergolesi Spontini, and this year's event includes a performance of his best known work La Serva Padrona. The festival runs from 2 to 17 September 2011 at Jesi, Ancona, Maiolati Spontini, Montecarotto, and Monte San Vito. The Ancona Jazz Summer Festival takes place in the splendid outdoor setting of the Mole Vanvitelliana in the port area of the Marche capital. The annual event features a week of performances by international artists and runs this year from 3 to 10 July. Plans are afoot to propose Urbino as the European Capital of Culture for 2019, according to news from the office of the President of the Marche Regional Authority, Gian Mario Spacca, earlier this spring. If chosen, it would certainly be a notable accolade to add to its status as a Unesco World Heritage site. The region can once again boast one of the highest number of Blue Flag beaches of any region in Italy, only just beaten this year by Liguria. The Blue Flag is awarded by the Foundation for Environmental Education across Europe to environmentally well-kept beaches. The prestigious "eco-label" is given to sites that meet strict criteria including water quality, environmental management, safety and other services. The region's sixteen towns entitled to fly Blue Flags for 2011 are, from north to south, Gabicce Mare, Pesaro, Fano, Marotta, Senigallia, Portonovo, Sirolo, Numana, Porto Recanati, Potenza Picena, Civitanova Marche, Porto Sant'Elpidio, Porto San Giorgio, Cupra Marittima, Grottammare, and San Benedetto del Tronto. The work of the 16th-century painter Vittore Crivelli, the lesser known brother of Carlo, is featured in an exhibition at Sarnano this summer. The show, the first major exhibition dedicated to the artist, runs from 21 May to 6 November 2011, and has over 40 works by both Vittore and Carlo Crivelli, and other contemporary 16th-century artists, including Gentile da Fabriano. The Vittore Crivelli exhibition website in English. After almost fifteen years of generous backing, the Marche regional authority has parted company with Marche Voyager. These sad farewells mean we'll have to find new ways to keep the site going, while still helping to promote our magnificent region. But independence also has its advantages - watch this space. The fabled medieval Holy Roman Emperor Frederick II was born in a tent on 26 December 1194 at Jesi in Ancona province. Frederick, known as Stupor Mundi for his stirring achievements, later he called it his special town, the very name seeming to recall that of Jesus.